Palm and RIM have unusual fiscal calendars, so they've recently released results for their Sept. - Nov. quarters. Turns out Palm is continuing to tank and thinks cranking out more Windows phones will save them. Have any of them actually used a Windows-based phone? I guess it's a better experience than the actual Palm OS which hasn't received significant updates since Palm was, uh, relevant. 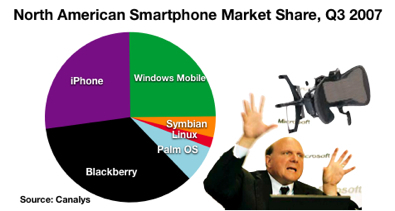 Meanwhile, RIM is on a tear, having discovered that ordinary consumers, and not just executives, might want smartphones, too. And here comes Apple, already grabbing larger market share in the US than Windows Mobile and closing in fast on BlackBerry.